The offshore supply vessels Maersk Searcher and Maersk Shipper sank in Celtic Sea on 80 nautical miles west off Brest, France. The vessels were under tow by supply tug Maersk Battler en route to Turkish scrapyard for recycling. The bad weather, heavy seas and storm caused water ingress in the ships, which capsized and later sank. The both supply vessels were unmanned and free of fuel and oils. There were no injured people and no reported water pollution. 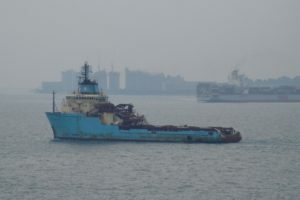 The crew of supply tug Maersk Battler succeeded to release the towing line, keeping their vessel afloat and without suffering any damages. The accident was reported to the local authorities, who started investigation for the root cause of the sinking and will make inspection for following of safety rules during towing. The local authorities confirmed that sinking did not carry any environmental risks. The offshore supply vessels Maersk Searcher (IMO: 9191369) and Maersk Shipper (IMO: 9169483) are sisterships with overall length of 82.00 m, beam of 18.85 m and maximum draft of 7.50 m. The deadweight of the ships is 3,903 DWT and the gross tonnage is 4,013 GRT. The vessels were built in 1999 by Keppel Singmarine shipyard in Singapore. The offshore supply vessels Maersk Searcher and Maersk Shipper were equipped with two MaK 6M32 and two MaK 8M32 engines, having total output power of 18,000 hp. Amazing how stupid someone csn be to tow in the North Atlantic this time of year,it was bound to happen.I am sure the insurance will cover it.